The UTC is meant to be a place to share, learn and define the way forward through individual and joint commitments to implement the New Urban Agenda. The format of the Campus is flexible and based on open facilitated sessions thus allowing for a high level of interaction. All participants will have equal opportunities to voice their views, ideas, and commitment to support their vision towards action. The topic of "Creating a Resilient and Inclusive Mumbai" is to discuss the different challenges in the city women, children and other vulnerable/minority groups face in living a quality life and in exercising their fundamental rights. [Participants will] deliberate on the same, so that we can collectively come up with an action plan that is hyper-local, community driven, practical and implementable... These sessions are co-created with several organisations and is reflective of the spirit of the UTC. Sia Nowrojee, Program Director of the 3D Program for Girls and Women, spoke on a panel on How can cities be better designed for women?, discussing the 3D Program's urban program and partnership with the waste pickers' union KKPKP and collective SWACH in Pune City, as well as 3D Program's convergent framework on the public safety of girls and women. 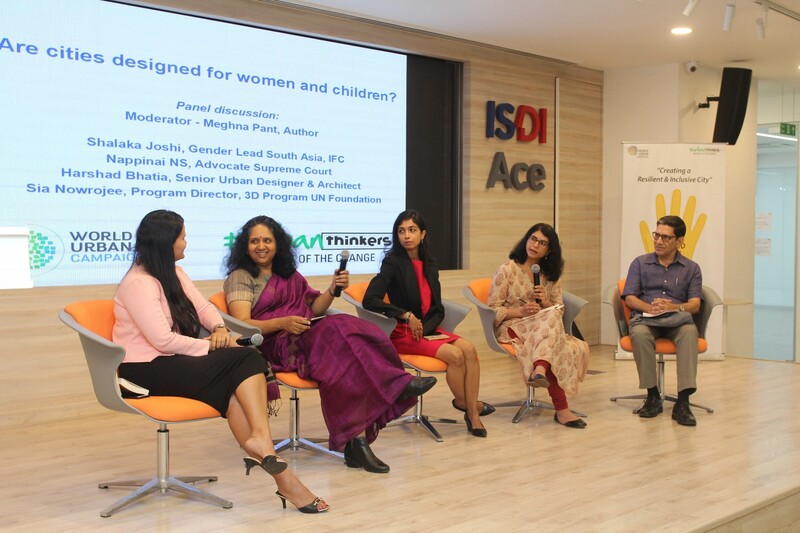 Also featured on the panel were Nappinai NS, Supreme Court Advocate, Salaka Joshi, Gender Lead South Asia, International Finance Corporation (IFC), Priyanka Borpujari, Journalist, and Harshad Bhatia, Senior Urban Planner and Architect. The panel was moderated by Meghna Pant, author of The Trouble with Women (Juggernaut, 2016) and others. To read our brief on public safety through convergent action for girls and women please click here. Used with permission from Elsa D'Silva, 2018.